The fervor over March Madness is akin to the excitement over the Olympics: even if you're not a typical sports fan, you can't help but be interested. Me, I’ll watch maybe one college basketball game during the regular season, but come tournament time I can't help but refresh scores and update my bracket like any other diehard. This year, two versions of CBS Sports Mobile's March Madness iPhone app should make that easier than ever. Last season, when I was looking for a way to keep me and my boyfriend updated while we were on the road, I stumbled across CBS’s March Madness on Demand iPhone app. The program, which delivered scores and live audio over 3G (and video over Wi-Fi), helped keep us tuned in while we trekked across the Northeast, despite the occasional glitch. Well, this time around, CBS Sports Mobile (in partnership with CBSSports.com) is again providing a lifeline to iPhone-equipped March Madness fans—two lifelines, in fact. Fans who choose the “lite” version of the app (free on the App Store) will receive scores, news, video highlights, and matchup information. Users can also tweet, message their Facebook friends, and build their bracket within the application. For those who want the ultimate viewing experience, CBS is offering a $10 “premium” version. 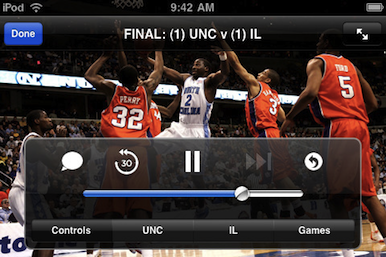 In addition to everything mentioned above, the program supports live video and audio streaming of every single March Madness game, whether you’re on Wi-Fi, 3G, or EDGE (CBS does caution, however, that “sufficient network coverage is required to stream live video”—in other words, your mileage may vary). Users can also enable the app to receive score alerts via push notification. March Madness doesn’t officially start until the Selection Show on March 14, but for those wanting to get a head start, both apps are currently available for download on the App Store for iPhone and iPod Touch; they require iPhone OS 3.1.2 or later.